Listen to interviews with family members of those who took part in World War 1 and have a connection with our local area. The interviews explore their memories of these soldiers and consequent investigations into their family tree. The interviews were conducted by oral historian Frank Heimans. This oral history project has been made possible through funding awarded under the Anzac Centenary Local Grants Program of which Woollahra Council shared 50% of the costs. 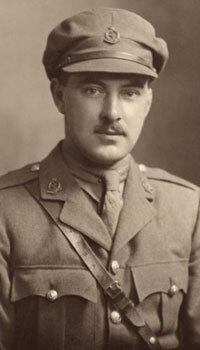 George Burrows began the war as a 24 year old freshly-trained engineer and ended it twice-decorated (Military Cross and Bar) for two separate instances of his courage and calm determination under fire. During his time in active service, Burrows was the first on the scene when the infamous Red Baron was brought down and he played a pivotal role in the capture of "Baby Bertha", the Amiens gun, the loss of which had a hugely deflating effect on German morale. Undeterred by his wartime experiences, Burrows offered his services again in World War 2 and, while rejected for active combat abroad, served out his time training officers. Three generations of George Burrows' family recount their knowledge of his service in WW1 – his daughter Jocelyn Black and grandson Stuart Black from their memories of him, and his great-grandson Tom Wilkie-Black from his research. George Burrows settled at Bellevue Hill in the interwar years, and the Black family have been based in Sydney's eastern suburbs ever since. Harold Collins was 22 years of age and living in Bent Street, Paddington with his family when war broke out. He volunteered for active service in September 1914 and was part of the landing at Gallipoli on 25th April 1915. Assigned to the 1st Field Ambulance, Australian Medical Corps, Harold was a stretcher bearer ferrying the wounded from the trenches down to the beach then onto the hospital ships. Harold survived Gallipoli and went on to join the Australian Flying Corps. He was awarded the Meritorious Service Medal in 'recognition of valuable services rendered in connexion with the war', finally returning home on 15 December 1919. In their interview about their father and grandfather, Julia Edwards and Ben Eadie describe - through memories of Harold's storytelling and excerpts from his diary - Harold's experiences during the war, and tell of a man whose optimistic and positive attitude helped him make a successful adjustment to life back home after the war's end. Born and raised at Victoria Barracks, and educated at Paddington Central School, William Holmes was a local lad marked for leadership, which surfaced both in his career in the New South Wales public service, and in his distinguished military record. Holmes left for active war service in 1914 as the chief executive officer of the Metropolitan Water Board - a position he had held for nearly 20 years - and in the commanding role of the Australian Naval and Military Expeditionary Force, despatched at British request to neutralise and occupy German territories in the Pacific. With this commission, Holmes had the distinction of leading the first Australian force despatched, steering the earliest campaigns to officially involve Australian infantry and naval recruits in the 1914-1918 war. 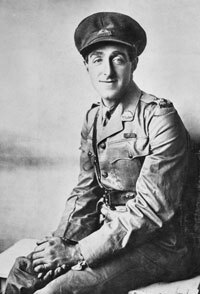 Holmes's war service continued at Gallipoli, where he commanded the 5th Brigade of the AIF - and temporarily, during the evacuation, the 2nd Division - and then on the Western front. Here he would receive what would be his final promotion, to the rank of Major-General, with charge of the 4th division. 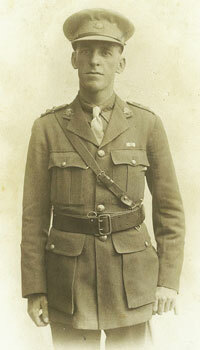 He was killed by an exploding shell while escorting the NSW Premier, William Holman, on a tour of the battlefields. By all accounts, Holmes was universally popular, respected and admired. 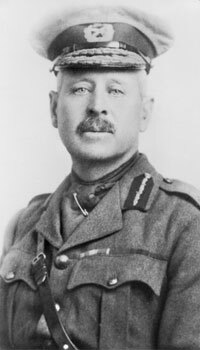 The life and contribution of General Holmes is recalled in this oral history by his great-grandsons Richard and Geoffrey Travers. Beyond their family connection, both are well-placed to tell his story, Richard being the author of Diggers in France, and Geoffrey currently involved in editing an earlier manuscript on Holmes for publication. 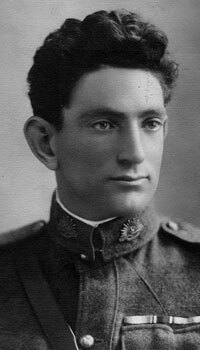 Leonard Keysor was a London-born Jewish lad with a spirit of adventure, working in Sydney and living with fellow ex-pat family members in the eastern suburbs - when war broke out in August 1914. Joining up at Randwick when the call came, Keysor was within the first thousand men to enlist and took part in the famous "landing" at Gallipoli. Keira Quinn Lockyer was writing up her family history when she discovered the full extent of her great-uncle's war story and realised it deserved a standalone book. In this interview, Keira draws on memories shared with her by Keysor's wife and daughter as well as her own research into his heroic actions and extraordinary achievements. In 1915 Lord Kitchener sent an urgent request to Australia to send 100 doctors to boost the number of medical professionals treating the wounded on the battlefields of World War 1. One hundred young men quickly answered the call and volunteered for active service. These doctors became known as 'Kitchener’s 100' and six of them were associated with the Woollahra district: Norman Walford Broughton, Clive Farran-Ridge, Eric Philip Blashki, John ('Jack') William Farrar, Sir Norman McAlister Gregg, and Robert Burnside Carter. As part of 'Kitchener’s 100', these doctors from Woollahra cared bravely for the wounded on the battlefields of France and Belgium from mid-1915 through to the end of the war (Norman Broughton was killed in action in France in 1916). Lina Moffitt became interested in writing whilst compiling her family tree. Turning her skills to compiling a list of people who had volunteered for WWI at Rylstone she uncovered one doctor, Dr Jack Farrar, who was part of a larger group of doctors called 'Kitchener’s 100'. Lina was inspired to investigate the story of all the 100 doctors and has written a book with detailed biographies on each. In this interview Lina outlines the background of 'Kitchener’s 100' and goes into further fascinating detail about the experiences of the six doctors associated with Woollahra.